Thomas Wyatt was born to a family of royal favor. His father, Henry Wyatt, was honored by Henry VII for his Lancastrian support during the reign of Richard III and assumed the roles of ambassador in Scotland, Privy Council member, and guardian of Henry VIII. When the new King inherited the throne little changed and Sir Henry was a privy councilor as well as Knight of the Bath and constable of Norwich Castle. So when his wife, Anne, gave birth to a son in 1503, this boy’s place in a royal court was guaranteed. Although Wyatt’s childhood is unknown to us, his debut at the English court took place in 1516 where he served as Sewer Extraordinary to King Henry. This is the same year in which he entered St. John’s College in the University of Cambridge. 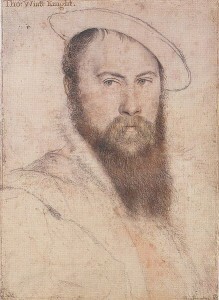 At the young age of seventeen, he married the daughter of Thomas Brooke, Lord Cobham, Elizabeth Brooke and one year later, in 1521, they had a son, Thomas Wyatt, the Younger. Their marriage wasn’t a joyous one and around 1525, Thomas charged Elizabeth with adultery and they separated, although no men have been linked to her name. Between 1524 and 1535 Wyatt’s career took off and he became Commissioner of the Peace in Essex, Clerk of Henry’s jewels, and Esquire of the Body. He was also an ambassador and partook in an embassy to annul Henry’s marriage to Catherine of Aragon. He served at Anne Boleyn’s coronation in 1533 and was knighted in 1535. Puzzlingly (or perhaps not), his interest in Anne Boleyn began just before his separation. At the arrival of this sophisticated young woman from France, Wyatt fell ill with love and never seemed to recover. Whether his affection was requited is doubtful and whether it went anywhere is even more so. At the time Anne caught his wondering eye, she was already experiencing young love with Henry Percy and, later, King Henry, with whom Wyatt stood no chance of competing. The only evidence of Thomas’ relationship with Anne comes from a Spanish Chronicle out to slander Anne’s name. Wyatt’s poetry as well shows a deep, but one-sided romance, referring to Anne as “That Brunet” who “hath my hand, my wit, my will, and all”. Although Wyatt’s was enjoying life as an up-and-coming courtier, in 1536 he found himself in the Tower, suspected of having carnal knowledge of the now Queen Anne. There is no evidence to back this theory after Anne’s marriage, and Wyatt protested his innocence, saying he had not wronged the King “even in thought”. Speculation on Wyatt’s fate varied throughout his imprisonment, but on 19th May 1536, he viewed the execution of the woman he loved with his head intact. He was released just before his father’s death in November. Wyatt had a fast, but brief, return to favor and served as an ambassador to Charles V until 1540. Yet in 1541, ever attracted to trouble, he was again in the Tower of London, this time for insulting the King in his dealings with Cardinal Pole. It was the young Queen Katherine Howard who granted his pardon, but only if he would reunite with his estranged wife Elizabeth. Of course, Thomas agreed and reclaimed his title of ambassador, but these would be his final days in power. He soon fell ill and died on 11th October, 1542, at around 40 years of age. Wyatt’s family has as great a legacy as he himself. His wife was one of the women proposed as Henry VIII’s sixth wife, and his son led the Wyatt Rebellion against Mary I. But I believe Wyatt himself carries a fascinating legacy. Although his poetry was published after his lifetime, he’s come to share the title “father of the English sonnet” with Henry Howard. But the way he mixes dreary humor with romantic tragedy shows us the mysterious man he was. Did his wife really commit adultery or was Thomas only willing to be in love when it was poisonous or inconvenient? Was Anne Boleyn’s unavailability perfect for a man who reveled in his own heartbreak? Why was the romance in his life that of a 3-D movie, right before his eyes yet strangely impenetrable? I believe that he was unwilling to find love that brought as much joy as it did sorrow. No, Thomas Wyatt could only ever be eternally lovesick.